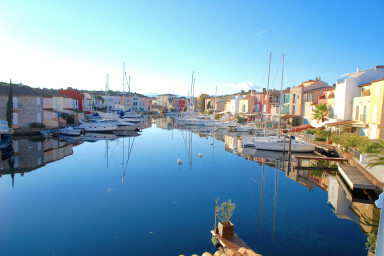 A wide house close to the beach and the center of Port Grimaud. Beautiful wide house next to the beach of Port Grimaud. On the ground floor, a large living-room / dining-room with an open kitchen and guest toilets. On the first floor, a spacious masterbedroom with a lounge, a shower-room and a sauna. On the second floor, four bedrooms, a bathroom and a shower-room. On the street side, a garden with a jacuzzi. On the canal side, a terrace extended by a large wooden pontoon with a lovely view/ 13m x 10m mooring, perfect for a boat and a dinghy or jet-skis. 2 parking spaces in the patio in front fo the house. A great house well located close to the beach !